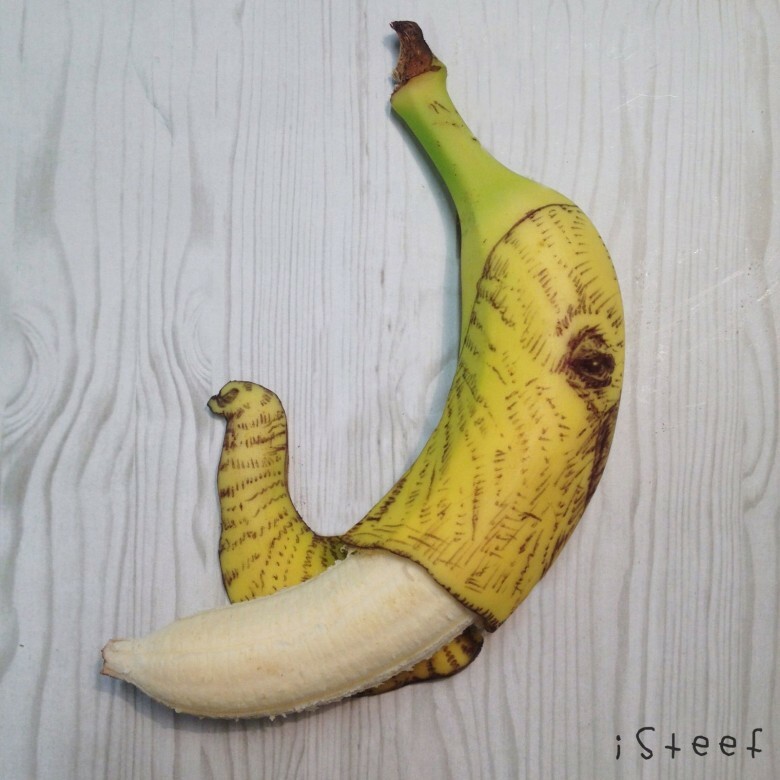 Stephan Brusche was bored and starting to play with his food when he made a discovery that would change his life: Bananas are nice to draw on. Graphic artists are paid to think this way, and Brusche was being urged by his wife to promote his work to a wider audience using Instagram. That smiley face, posted more than three years ago, received more likes than his work illustrations. And thus Fruitdoodles was born. Since then, Brusche has transformed more than 200 bananas into fine art. Brusche kept his day job, but Fruitdoodles has grown into a book, a 2015 calendar and an Instagram following of more than 18,000. It’s also generated interest from the government of Ecuador, which just so happens to keep the world in bananas — and Brusche in canvases. Bananas don’t make an obvious choice for a drawing surface. You quickly run out of room on the fruit’s narrow, rounded surface. Then there is the issue of decay. Bananas spoil quickly. But to look at Brusche’s Fruitdoodles is to peel back — um, sorry — the layers of the mind of a working artist. For some images, he takes advantage of the skin’s yellow color, imagining the gold, vertical figures embracing in Gustav Klimt’s The Kiss or the long neck of a giraffe reaching for the highest tree. In others, he works in bunches. Four side-by-side bananas brought The Beatles crossing Abbey Road to Brusche’s mind. And for Christmas, he carved away the peels to reveal an angel hovering over the baby Jesus, with Mary and Joseph each on their own peel. Brusche draws in ballpoint pen, then carves out the lines with a toothpick to expose the peel so that his sketches turn brown. This activates and accelerates the spoiling, so he works quickly to finish and photograph it with his iPhone. He typically finishes a Fruitdoodle within an hour. Brusche usually eats the banana afterward. He is in discussions with the Board of Tourism in Ecuador, the largest exporter of bananas, about his banana art. A company in Italy that publishes work diaries for school children is also interested in his Fruitdoodles. Brusche has also worked with other kinds of fruit — a pear recently became a penguin — but always returns to the smooth surface of the banana.